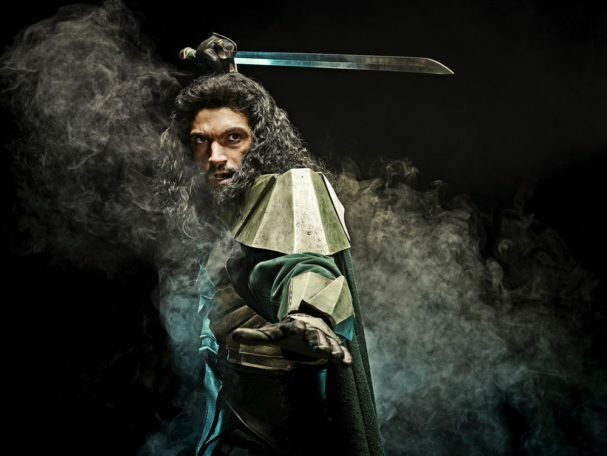 I spoke with Mido Hamada about his role as Eamonn on Emerald City, which premieres Friday on NBC. Eamonn is The Wizard’s most trusted confidant and loyal servant. He stars alongside Vincent D’Onofrio, whose portrayal of The Wizard is extraordinary. Mido also spoke about his work with Wolf Connection and his new Starz series Counterpart. Counterpart is an espionage series starring J.K. Simmons that will be premiering this year on Starz. Don’t miss the premiere of Emerald City this Friday on NBC. LL: I just watched the premiere of Emerald City. I liked the darker side of the story. Mido Hamada: It’s definitely a modern version and a modern take. It’s, kind of, for this generation. What Judy Garland’s version was for that generation, hopefully Emerald City will be everybody’s new take on Oz and that’s what they are going to remember. LL: What can you say about the series and how it re-imagines The Wizard of Oz? Mido Hamada: I think one of the beautiful things is that everybody has these amazing images and feelings towards the Judy Garland version and I think what we did is took the adaptation of L. Frank Baum’s novel and gave it a modern spin. People would maybe compare it with Games of Thrones and we just made it hip for this generation, and made it more palatable for how we would want to tell that story now. Hopefully, when people start thinking about Oz, they will start thinking of Emerald City in the future. It’s going to be unlike anything that television has shown in terms of beauty. We were incredibly blessed to have Tarsem Singh direct all ten episodes. He’s such a visual master that he really gave it an identity and a visual style that is going to make it look unlike anything else that we’ve seen on television. LL: I have to ask about the costumes, the sets, and the filming locations because they play such an important part in the series. Mido Hamada: Yes. A lot of that is down to Tarsem. He had extensive knowledge in terms of locations. I think he broke the record with one of his movies called The Fall. They shot in over two hundred different locations, so the thing that he insisted upon when he came on the project was that he would direct all ten episodes. Once they had written all ten episodes and okayed it, we basically went about shooting it as if it were a ten-hour movie. I remember on my first day of shooting that we were shooting scenes from episode ten, which is obviously very daunting for an actor because you come in and you’ve never really encountered your character before you start shooting stuff from the last episode. [Laughing] That was a challenge. He wanted to shoot everything on location. He didn’t want to CGI that much. We spent the first month and a half shooting in locations in Spain. We filmed at a national park in Croatia where they have frozen waterfalls. We moved on to our studio, which was in Budapest, and started shooting in Budapest and the surrounding areas. I think Tarsem is such a genius and a maverick when it comes to visual styles that he gave it his own feel. The costumes were amazing. I had a costume that I think looked spectacular and I hope that’s what audiences will come to see and love. LL: The witches’ costumes were gorgeous. Mido Hamada: Yes. They were quite something, seeing them live and then on screen. They were amazing. They put so much work into it. 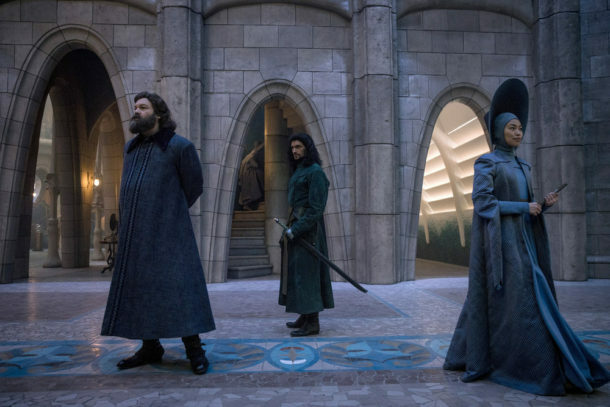 LL: Is Emerald City set up as just a ten-episode mini-series or will we get more seasons if it’s popular? Mido Hamada: We are hoping to get more seasons. At the moment, we shot the first ten episodes and we have obviously enough material. L. Frank Baum wrote fourteen novels that we can shoot. It’s quite an expensive show—as you can see with the costumes, locations, etc., it really depends on getting the word out and building an audience. If we build an audience, in the first couple of weeks, I’m sure that NBC will green light us immediately for season two. We are all hoping that is what will happen. LL: What do you think were some of the important aspects, from the original, that helped make the foundation that they were able to build upon for this series? Mido Hamada: All of the characters that appear—Dorothy is still Dorothy, except that she’s an older version than what Judy Garland was. There is a tin man, a lion, and a scarecrow but they are slightly different from what you remember them to be. One of the biggest differences between that version and our version is that when you come across all of the characters in the Judy Garland version—everybody is who they are already. In our version, everybody becomes who they are. Tin Man doesn’t become Tin Man until halfway through the season. The lion doesn’t become Lion until towards the end of the season. The scarecrow becomes the Scarecrow in the beginning of the season. That’s the kind of discovery that the audience goes through. It’s a kind of guessing game. You really have to follow the journey, and the show, to try and figure out who is who because it’s not a given. That’s one of the main differences. LL: I really loved the new Toto. Mido Hamada: Yes, Toto is a big, giant German Shepherd who doesn’t listen to any commands. He was a handful, quite a diva. He was very much a diva on set. [Laughing] He was probably the most difficult cast member that we had to work with. LL: Did you get to spend any time with Toto? Mido Hamada: I personally didn’t because Toto was always next to Dorothy and my character chases Dorothy and tries to catch her. We were always in hot pursuit of them. I saw him around, but I wasn’t getting any scenes with him—maybe just one or two. LL: You play Eamonn and when we first meet him he’s being given strict orders from The Wizard, played by the phenomenal Vincent D’Onofrio. Mido Hamada: Oh, of course, the immensely talented Vincent D’Onofrio. My job is basically, I do The Wizard’s bidding. When we come across The Wizard, he’s the ruler of Emerald City. The theme of the first season is science versus magic. The Wizard is gone and he won the battle of Emerald City, and he has outlawed magic because he is a strict follower of science. The person who enforces these rules is my character Eamonn. Anything that The Wizard decrees, I have to go and put it in action. When Dorothy, kind of, comes from the sky and lands somewhere in a different part, he of course knows where Dorothy is coming from and he makes sure that I go and chase her and bring her back dead or alive, but also makes sure that nobody else sees her. LL: What was it like working with Vincent? Mido Hamada: I loved working with Vincent. Vincent is an actor’s actor. Working together, we had a lot of scenes together, I loved working with him because you know that he’s going to be in the moment and you are going to discover the moment together and share the moment together. He’s very much a generous collaborator. Working and sharing space with him was fantastic. I loved working with him. Actually, I loved working with everybody. I think this is a phenomenal cast that they put together and quite by accident, a very diverse cast. I think that is one of the strengths of the show. We didn’t really realize how diverse the cast was until we sat around a table at the read through. The people at NBC did a fantastic job of putting this cast together. I think their initial intention was to get the best people for the parts and by accident they came across this incredible international cast. If you look at the cast members—West is an Eastern European actress from Romania, Dorothy is from Puerto Rico and Guatemala, Isabel Lucas is from Australia, Roxy Sternberg is Nigerian, Florence Kasumba is from Kenya—it’s an amazingly diverse cast that’s a true representation of the world that we live in today. It makes Oz that much more relatable. LL: I’m not sure if you can answer this question without spoiling anything, but several people wanted me to ask you about Eamonn’s conflicts and his loyalty to The Wizard. Are we going to see any of that played out? Mido Hamada: Absolutely! His loyalty is going to come into question. I think one of the great conflicts with him is that he’s a warrior in the truest sense of the word. If you want to compare him to a warrior he is like a samurai. That’s kind of where I took most of it from. A samurai’s main job is to serve, so he serves The Wizard. At the same time, he’s also the father of three children and a husband to a wife. He has a completely different side to him when he’s in his own space. As he does The Wizard’s bidding, the conflicts arise in him and the questions arise in him as to the morality of what he’s about to do each and every time. We do get to see that conflict in him and see how he deals with that and what choices he makes. Some of the choices that he’s made in the past, and I can say that without giving too much of a spoiler, some of the choices that he’s made in the past are coming back to haunt him and he has a chance to redeem himself. That is part of his journey. His story unfolds throughout the course of the show. In the beginning, he appears strictly as someone who follows orders but as we get to know him and understand him, throughout the season, things start to shift and change and we get to see behind his mask a little bit. We get to understand how he’s become who he’s become. Mido Hamada: Right now I’m filming a new show for Starz called Counterpart, which is a fantastic espionage thriller. It stars J.K. Simmons in the lead, who’s a phenomenal colleague and I love working with him. We are shooting that at the moment and will be shooting it until May because I’m shooting the entire first season. It’s a blessing to be in two shows at the same time. I’m very excited about that show as well. LL: You also work with Wolf Connection. Mido Hamada: I do. That’s one of things that I’m very, very passionate about. There is an organization here called Wolf Connection. Basically, they rehabilitate wolves or wolf dogs that are usually sent out to be killed and they rescue them. They don’t just rehabilitate them, they use them to rehabilitate children as well. A lot of children that come from disenfranchised families that have been abused, that are part of gang culture, or have addiction problems—and we are talking many teenagers now—they are brought to Wolf Connection. Each of these young adults get a chance to connect with a wolf. Naturally, each one of these children choose a wolf with a similar story of abuse and the wolf is somehow able to teach these children how to deal with their demons and their past. In the presence of each other, healing can then occur for both sides. It’s an amazing thing. I’m very happy to be a part of it. I visit them and try to bring attention to Wolf Connection as much as I can. LL: That’s amazing. They are incredibly beautiful animals. Mido Hamada: They are unbelievable. They are truly, truly unbelievable. They are not dogs. I think when you go there and you expect to meet a dog you will be disappointed. These are not dogs, these are wolves. They just deal with your energy. They suss you out and decide if they want to be around you or not. In that aspect, they are more like cats than dogs, to be honest with you. They are very picky and won’t just sit there and show you their bellies. Everything has to be earned. You have to earn their respect and earn their affection. It doesn’t just happen. You earn it through your energy. You earn it by how you approach them by not trying to be dominant over them, but by trying to understand what they might be feeling. That’s why they have a lot to teach. That’s why these young boys and girls, who come with loads of problems, feel like there is somebody there that understands them. You have to earn the trust of these youths because they have been hurt so badly. 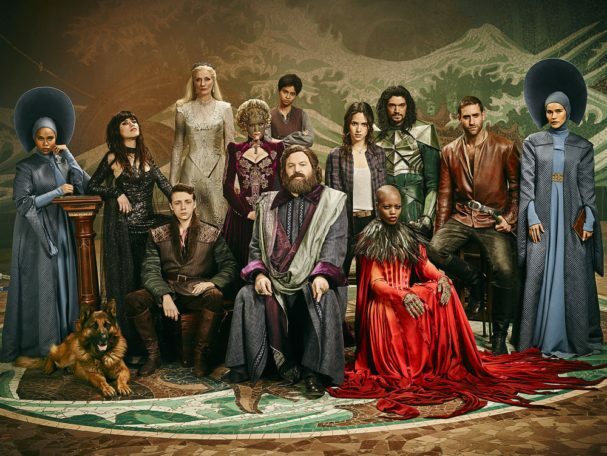 Emerald City premieres Friday, January 6 at 9/8c on NBC.